Rumors Flying Nearly as Fast as Their Subject: Have Gravitational Waves Been Detected? Last week the Harvard-Smithsonian Center for Astrophysics (CfA) stated rather nonchalantly that they will be hosting a press conference on Monday, March 17th, to announce a “major discovery.” Without a potential topic for journalists to muse on, this was as melodramatic as it got. But then the Guardian posted an article on the subject and the rumors went into overdrive. The speculation is this: a U.S. team is on the verge of confirming they have detected primordial gravitational waves — ripples in the fabric of spacetime that carry echoes of the big bang nearly 14 billion years ago. If there is evidence for gravitational waves, it will be a landmark discovery, ultimately changing the face of physics. Not only are gravitational waves the last untested prediction of Albert Einstein’s General Theory of Relativity, but primordial gravitational waves will allow astronomers to glimpse the universe in its infancy. “It’s been called the Holy Grail of cosmology,” Hiranya Peiris, a cosmologist from University College London, told the Guardian. “It would be a real major, major, major discovery.” Any convincing evidence would almost certainly lead to a Nobel prize. The signal is rumored to have been found by a telescope known as BICEP (Background Imaging of Cosmic Extragalactic Polarization), which scans the sky from the south pole, looking for a subtle effect in the cosmic microwave background (CMB): the radiation released 380,000 years after the big bang when space became transparent to light and photons were allowed to travel freely across the universe. While the CMB has been mapped in exquisite detail, astronomers think that hidden within the map is a second fingerprint, which would reveal gravitational waves. Its radiation was scattered toward us from the universe’s earliest atoms, similar to the way blue light is scattered toward us from the atoms in the sky. And just as the sky is slightly polarized — the waves have a preferred orientation — so is the CMB (on the level of a few percent). Cosmologists are digging through the data, searching for a subtle twist in the polarized light, known as B-modes. If a gravitational wave moves through the fabric of spacetime, it will squeeze spacetime in one direction (the universe will look a little hotter) and stretch it in another (the universe will look a little cooler). The photons will scatter with a preferred direction, leaving a slightly polarized imprint on the CMB, due to the passing gravitational wave. Not only will detecting this slight polarization pattern in the CMB allow astronomers to uncover evidence of primordial gravitational waves but they will provide proof that immediately after the big bang the universe expanded exponentially — inflated — by at least a factor of 1025. While the theory of inflation is a pillar of big bang cosmology and helps explain key features of the observable universe today (i.e. why the universe is outstandingly uniform on such massive scales), many physicists don’t buy it. It remains a theoretical framework because we can’t explain what physical mechanism would have driven such a massive expansion, let alone stop it. Inflation is the only mechanism with the ability to amplify gravitational waves, born from quantum fluctuations in gravity itself, into a detectable signal. But even if the rumors prove true, it’s crucial to remain skeptical. Extracting the signal is extremely tricky. The CMB’s temperature varies by a few parts in 100,000. In comparison, B-modes account for just one part in 10 million in the CMB temperature distribution. The microwaves also travel across the entire observable universe first. 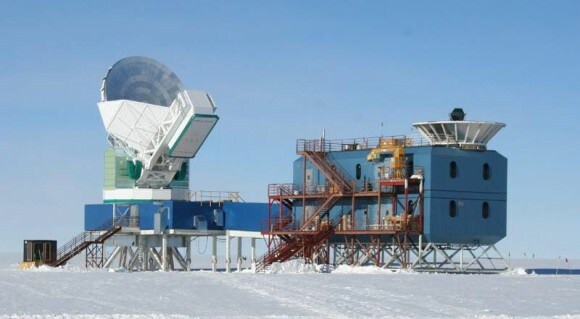 Only last year the signal was detected in the CMB for the first time using the South Pole Telescope, but it was in fact distorted by intervening clusters of galaxies and not intrinsic to the CMB itself. The announcement will be made on Monday at noon EST. It remains a theoretical framework because we can’t explain what physical mechanism would have driven such a massive expansion, let alone stop it. That depends on what is meant by “explanation”. As we can see in the Planck papers, there are many different hypothesized inflationary mechanisms (predictive explanations) on the table. Albeit not as many as with the less resolved WMAP data, meaning these theories can be constrained and perhaps tested, say by primordial gravity waves. The mechanisms runs the gamut from modifications of general relativity (such as “natural inflation”) to adding relativistic quantum fields (such as “inflatons”). Quite similar to how dark matter has been treated. In the case of quantum physics predictions it seems one field as opposed to several is preferred by both WMAP and Planck, and Planck prefers it to look something like the Higgs fields, only simpler (real valued instead of complex valued). So seeing that the Higgs seems to be standard Higgs (4 fields, 1 of which can make the visible Higgs), a scalar boson is no longer unprecedented. But just as for the Higgs fields, the observed parameters of the inflaton field would be as difficult to predict unless I’m mistaken. That makes physicists less willing to “buy it”. [FWIW, this layman is not buying the GR modifications regardless of how neat they appear. Cf dark matter, there too GR was initially easiest to push around. But in the end such modifications were overwhelmed by contrary data. I suspect GR will be like Newtonian theory – correct at describing fundamentals of gravity, momentum, energy and mass for larger scale interactions but when it comes to fully explaining the 4 known forces in the Universe (and subatomic realm) and by extension trying to figure out cosmogenesis, QED and suchlike Quantum theory gets closer to mapping-out / simulating T-0. If this rumor is true, it will not be a detection of gravitational waves, rather an observation of something predicted to exist because of the presence of gravitational waves, perhaps one could say indirect direction. Furthermore, it wouldn’t be the first indirect detection. The Hulse-Taylor binary, discovered 40 years ago, is known to emit gravitational waves. We have indirectly observed their presence since the orbit is decaying according to GR. Still, if true, an amazing confirmation of inflationary theory! Last week, this paper (http://arxiv.org/abs/1403.2369) was posted in arxiv about this topic. As noted in the story, this is the first scratchy data showing B-mode. This was done with POLARBEAR in Chile, as opposed to BICEP at the South Pole. Is there competitive pressure to announce?